The first thing you notice while un-boxing this game is how fantastic it looks! The beautiful artwork (by Marie Cardouat of Dixit fame) and three-dimensional pieces go a long way to immerse players in the world of Steam Park. Each player starts with a flat “ground tile” in front of them, and will compete each round by simultaneously rolling and re-rolling six dice to determine their actions this turn. Turn order (and dirt penalty) is decided by whoever finalises their dice rolls first each round. Players then use their turns to build rides or stands, attract visitors, clean dirt, expand your park or play objective cards, depending on their dice rolled, sometimes also using special abilities. Players also earn money (and dirt) each turn based on the number of visitors on their rides. The ride pieces are three-dimensional and you literally put the visitors on top of these as if they were riding. Gamers will find it hard not to be absorbed and feel like you’re really building your own park! Best: The amazing game pieces and three-dimensional feel. Worst: The currency consists of small carboard dollar-note-style pieces. They are good quality and attractive but soon become annoying to use as they fall over if you stack them, and take up too much space if you spread them out in different denominations. In short, the game is great fun and extremely pretty. It’s a relaxing and fun game with a finite length (6 rounds), which I like. The gameplay doesn’t quite vary enough to make it into my top five, but Steam Park is never boring and its uniqueness keeps it on my second shelf. 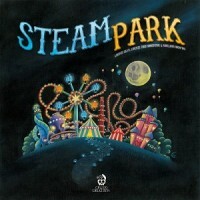 Add a Review for "Steam Park"